We are looking for a Facilities Handyman to carry out site wide facilities maintenance and to undertake upkeep and repair tasks at the interior or exterior of Pieminister kitchens. We’ll rely on you to keep our facilities in perfect condition by doing various odd jobs. You must be well-organised with strong general repair skills. The ideal candidate will have a keen eye for detail and the ability to collaborate between department heads. This role is based here in our Pieminister Kitchens, Charlton Road, Brentry. From Pieminister’s humble beginnings, selling pies at music festivals and market stalls, we have now grown to over 12 restaurants and have ambitious expansion plans to roll out more restaurants up and down the country. Pieminister is a multi-channel business, developing pies (and other complimentary products) for Pieminister’s restaurants, cafes, brand licenses (which include pubs and universities) and independent retailers, delis and supermarkets. Pieminister also host pie and mash weddings, cater for corporate events and feed festival goers in the summer. 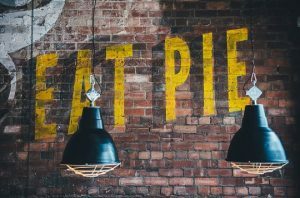 Pieminister is still a family owned business and has 150 pie experts making over 6 million pies a year and up to 90,000 pies a week in Bristol. Pieminister is the UK’s only national pie company to use 100% free range British meat. And the provenance of ingredients is a key part of what Pieminister stand for. Pieminister have been recognised as one of the 1,000 businesses to inspire Britain, won awards for all Pieminister pies and are hailed in the press as the saviour of the British pie. The working environment at Pieminister is fast paced, varied, high-energy and we have lots fun along the way. We don’t wear suits, but we are serious about business and our ambition to be the UK’s most loved pie brand. And… a Pieminister tea towel, The Holy Pie-ble and free Pie Feast vouchers to try out the restaurant menu! To apply for the role, please send your complete Pie Application Form, CV and covering letter to kate.millerjones@pieminister.co.uk with the reference: Facilities Handyman. Closing date 02/05/18.